To call the Yukon Quest merely a dogsled race is akin to calling the Superbowl just another football game. The Quest is the penultimate showdown, a grueling match of dogs and man (or woman) against whatever nature can conjure up on its worst day. It is a 1,000 mile long endurance test of man and beast. Make no mistake about it; every musher and every dog is a finely tuned athlete, melded into a team that, if all goes well, functions seamlessly. These are working dogs in every sense of the word. 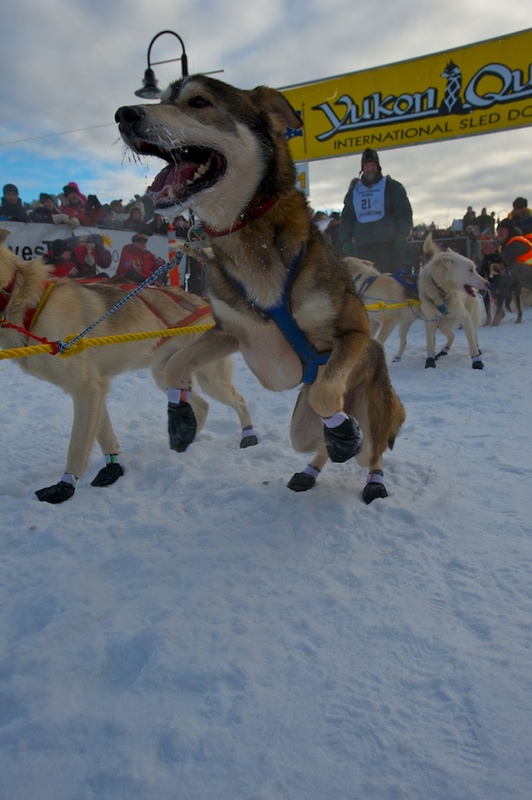 They live to run and the love and devotion between musher and dog is evident before each racer takes off. Hugs, words of encouragement, last minute snacks for the dogs are proof of that caring. The city of Whitehorse, Yukon takes on the air of a carnival during Quest on alternate years. 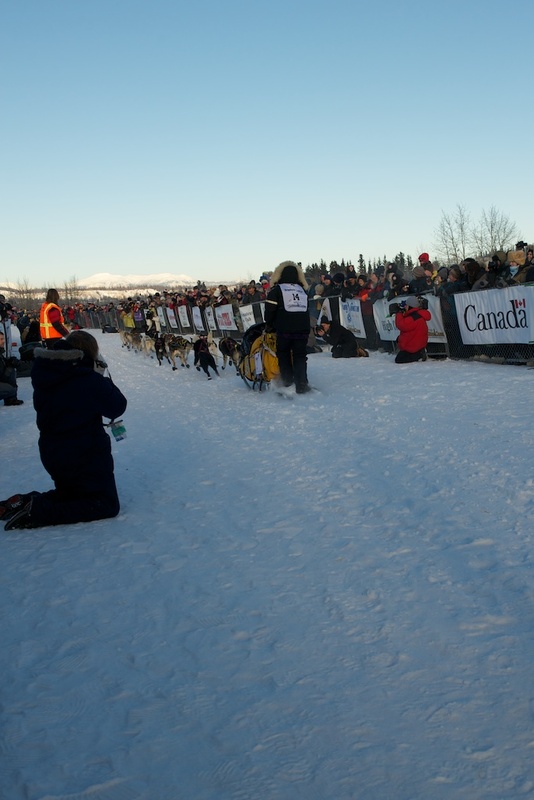 Since the race takes mushers from Whitehorse to Fairbanks, Alaska, the starting venue alternates between the two cities. There is the kickoff banquet, a lively affair which anyone can attend. In Yukon, leave your formal wear at home. Typical dress at the banquet consisted of mukluk boots, wool sweaters and beaver fur hats. Ten veterinarians examine every dog before the start and at every mandatory checkpoint. Led by Dr. Alan Hallman from Arizona, the Quest’s high standards are evident in the healthy looking dogs. There are mandatory stops long the route to allow both mushers and their dogs to rest. Each musher starts the race with 14 dogs. Few ever finish with all their dogs. Any dogs who become ill or injured are left with the team’s handlers at a checkpoint and immediately treated by the vets. This sport draws such passionate participants, every one of the 12 vets is a volunteer. The winning musher will average about 100 miles per day. You simply cannot appreciate that feat until you arrive in the Yukon. The teams will encounter -40F temps regularly throughout the race. They will have to climb mountains that would challenge the most able mountaineer. Even worse, they will have to traverse steep mountain downhills that brings every skill to bear as they try to prevent the sleds from careening out of control. Before the race begins, the expressions on the faces of the mushers changes radically from the celebratory mood of the banquet the night before to a high seriousness of purpose as each one loads his sled, feeds his dogs and finally, just minutes before the race starts, harnesses his dogs to the sled. 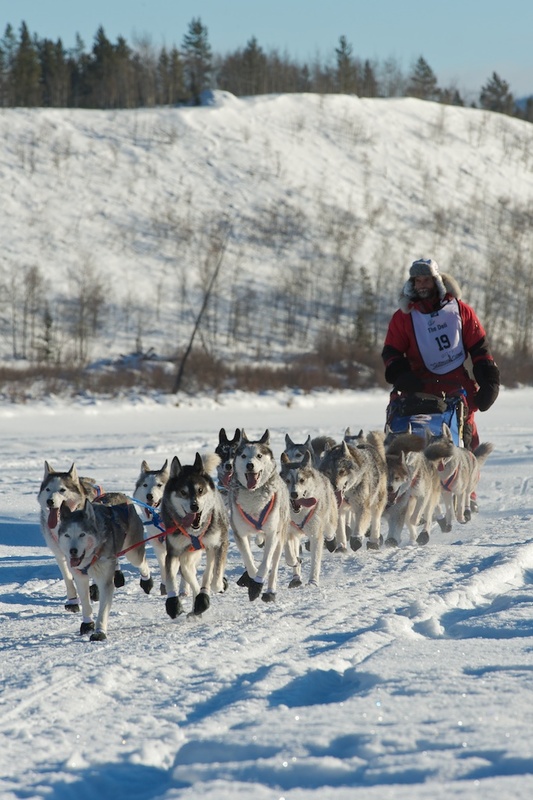 Five of the 25 mushers are women. At the start of the race I’m in the chute, positioned with probably 25 other photographers from around the world. I rarely do event photography - my specialty is landscape and wildlife- and in the excitement of the race I am so busy watching the goings on I sometimes forget to keep shooting. Each musher leads a team into the chute and gives final hugs to his or her 14 team members. The noise of the dogs barking and howling, wanting desperately to start pulling, is overpowering. The mushers check the dogs’ booties, designed to protect the animals from ice cuts. They pull at the rigging to make sure they are secure. They whisper words of encouragement to their charges. Thousands of spectators line the starting chute cheering each competitor. Every three minutes the race officials send off another team. In a little over an hour the din of the dogs is replaced by an eerie quiet, as the crowds saunter off to the many other events around town. The Yukon Quest is a family event, a true celebration of man and dog pitted against whatever nature throws at them. What makes it all the more wonderful to me is that it takes place in the glorious Yukon.